Just now, Alkaram Eid dresses 2016 have been launched for the fans. Rs. 12500 is the price of this collection which is available in 3 piece suit while you can get the dresses of this collection in stitched form. Famous actress and model Syra Shahroze is doing the modeling for this collection and she is looking nice. 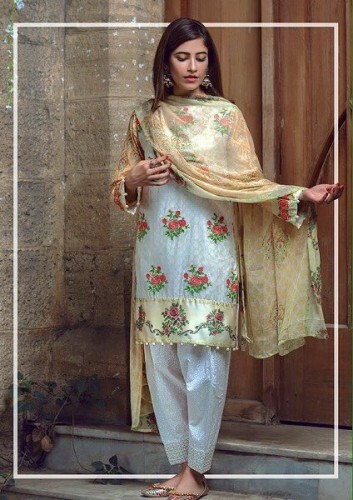 Formal dresses are available in this eid collection as dresses of chiffon wear fabric are these on which embroidery work is used for their embellishment. You can view the pictures of these 2016 Alkaram Eid dresses here and these pictures would help you decide and choose the perfect type of dress for you during the occasion of Eid. 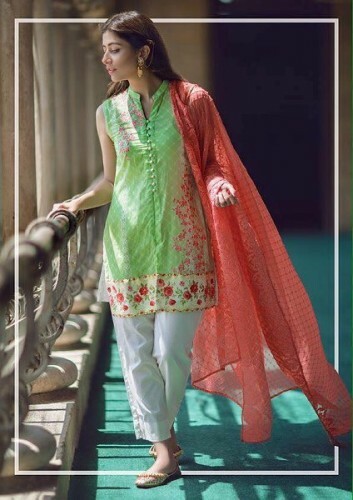 You will find very beautiful dresses in this Eid collection by the brand while the shirts in this collection are designed as medium length which are suitable to be paired with cigarette pants or trousers. You can easily wear these Eid dresses 2016 by Alkaram on eid without any problem as there are ready made dresses available in the collection of Alkaram Eid dresses 2016 for girls. The fashion house has used very light colors in the dresses of this collection including light maroon, light pink, off white, purple, tea pink and green shades. Here below, we are providing the pictures of Alkaram Eid 2016 collection for your information. You will surely like these eid dresses from this brand. Stay tuned with us as we will provide you more collections of the brand soon after the launch of its new collection. Subscribe for Latest Fashion News by e-mail. Enter your e-mail below and click Sign Up!